The last apparition of the BVM to Saint Bernadette, occurred in Lourdes on the 16th July, 1854. 162 years and one day later, we visited the Marian shrine. For one of us, it was his first time, his first experience, his first steps on the sacred soil surrounding the grotto at Massabiel. For the two of us, it proved to be one of the most fulfilling and rewarding experiences of our lives together. Even with delays, we arrived at the Hotel Paradis in Lourdes, on 17th July, 2016, in time for lunch! We had not travelled with any particular group, but were fortunate to meet up with two friends of ours from the same parish in Drogheda, Michael and Agnes, who were travelling with their son Noel, as part of the Cystic Fibrosis Ireland (CFI) group. They kindly invited us to join in with them, and for the rest of our stay in Lourdes, we were honoured to be a part of their mission, as well as experiencing our own private time in the presence of Our Lady. At the lunch-table we were joined by our friends from Drogheda, their son, and The Bishop from Drimnagh, who has supported the group for over forty years, in his capacity as tailor, procurer, fund-raiser, roadie, helper, morale booster and, occasionally, the provider of (questionable) comedic observations. We met the actual spiritual advisor to the group for many years, Father Terry, a Liverpudlian with strong Irish connections, and now based in Kilburn; a gentle giant of a man, with a wonderful sense of humour and a natural empathy for the suffering. The temperatures in Lourdes for the first three days were in the mid-thirties, definitely peaking at forty in places. The sky was a beautiful French blue and there was very little shelter from the radiant sun. The tarmacadam surface, while not bubbling, was sticky underfoot; and down past the grotto, by the bruliéres of burning candles, a waxy sheen overlay the pedestrian area. The crowd present on that first afternoon, was not large, by Lourdes standards, so it was possible to gain access to the grotto itself with little queuing. So drawn to the legend of Lourdes are we, that the first sight of the little spring, created by the scratching of a young girl in filthy soil, is almost breath-taking in its simplicity. Yet, when allowed to contemplate it, you picture yourself in the place of the young teenager, on her knees in the mud, in obedient, unquestioning devotion to her Lady; and wonder if you would have the courage to do the same on this day, while people wait and watch around you. From the spring, you walk a few steps to the slight outcrop of rock, feet above you, where appeared the BVM, to Bernadette. You do not see the statue which now stands there, in the exact place. You have to step back a few feet and look up to see it; and again you imagine where Bernadette must have stood or kneeled, to view her Lady. You touch the rock here, as indeed you have touched it since you entered the grotto, and say a simple prayer. And all around that area where you walk as a latter-day witness, there is a shiny ring of grime at roughly shoulder-height, where millions of hands and fingers, some holding artefacts, have gently pressed before you. Better not dwell too long here, for the stewards will remind you that many more are waiting, to follow in your footsteps. When you emerge from the immediate grotto area, you pass through the bruliéres of candles, on your way to the baths, which are there in response to the BVM’s direction to Bernadette to “…wash yourself there”. And so, you can obey that command and fully immerse yourself in the cold waters of the spring, which flows into several baths, divided by cubicles, manned by volunteers, who assist you each step of the way. It is a fact of life that fewer men attend Lourdes than women. This is represented by the attendance figures for the baths. Himself practically walked straight off the melting tarmac without queuing; and on a sunny, sweltering day, actually enjoyed the chilling, relieving experience of an immersion in the holy waters. He emerged in no time, with an almost beatific smile upon his face. Herself, on the other hand, was put off by the lengthy queues for the women’s baths. She was to learn, on another day, that, due to a shortage of helpers, the gates closed as early as eleven in the morning, and if women arrived after that, they were out of luck. After exiting the sanctuary through St Joseph’s Gate – the main entrance to the grotto, we left the neon-emblazoned ‘bric-a-brac of piety’ in our wake, and made for the more tranquil and dappled area, wherein stood the Lourdes’ offices of the Legion of Mary, of which organisation herself has been a member for years. Here, she renewed acquaintances with Marcello, the Italian administrator, whom she had met some years ago, when she worked here. This amiable man requested that she carry the Legion Vexillum or standard, in the candlelight procession on Thursday. To be asked to do so was a great honour, especially when the day in question would be the occasion of our 34th wedding anniversary. Despite being tired, we returned to the grotto after dinner for the 9 p.m. candlelight procession, one of two held daily – the Blessed Sacrament procession is held at 5 p.m. – in response to Our Lady’s direction to ‘come here in procession’. The gentle flickering of mass devotion, through peaceful imprecations and hymns, even on a bright Summer’s evening, was still impressive, and quietly overpowering before the image of Our Lady, aglow in front of the basilica. We returned to our room after that, satisfyingly exhausted, and after a cool drink and a small glass of wine, or two, fell into a restful sleep. Our first breakfast, and, unlike the stilted affairs of lunch and dinner, it was a glorious free-for-all. There were cereals, slices of ham and hard-boiled eggs, bread rolls, jams and spreads, and big, buttery, glistening croissants. You could wash as much of this manna down as you liked with cups of cappuccino from the coffee machine. As if this wasn’t enough, our friends from Drogheda insisted we help ourselves to their personal supply of Weetabix! Ah, bliss! Later that morning, we celebrated our first mass in the company of our friends from CFI, in the appropriately named Penitencerie. Father Terry was assisted at all of his masses by two brothers from London, George and Teddy, who, along with their parents – Michael and Noha – and their sister, Jo, had travelled to Lourdes from London with Father Terry. George and Teddy ensured everyone in the audience got ‘one’ when Father Terry presented us with small but symbolic artefacts after each Mass. They also took up collections, and made sure we were on time and all together for the group events. Their services were indispensable and they received many ‘thumbs-up’ and ‘high-fives’ in appreciation. After a shower, and lunch, we attended five o’clock devotions in the gigantic Basilique Souterraine St Pie X, or underground basilica, which was constructed in 1958, in time for the centenary celebrations. There was a solemn but proud moment when two members of the association processed by, holding the CSI banner aloft, taking their place amongst the organisations present. Dinner was unremarkable if well-prepared/cooked and presented, apart from desert, which consisted of a peach and a knife. Himself, by his own admission, lacks the sophisticated palate necessary to appreciate French cuisine. More glorious weather with the temperatures even warmer at times than the previous two days. We had to shower three times over the course of the next twelve hours or so. After breakfast the group met with Father Terry at St Michael’s Gate. From there, having led us through the Door of Mercy - where we were liberally showered with holy water by Teddy – he brought us on a walking tour of Saint Bernadette’s Lourdes. We crossed the river Gave and climbed up the narrow street to the Boly mill where she was born, and where she spent the happiest days of her childhood in relative comfort. But not too far from here was The Cachot or dungeon, where she lived during her family’s penury and during the time of the apparitions. We also visited the present parish church in the town, which houses the original baptismal font from St Bernadette’s time, and rescued from the original church destroyed by fire. In the afternoon, we celebrated Mass with the group in the Cité Saint-Pierre (Secours Catholique). 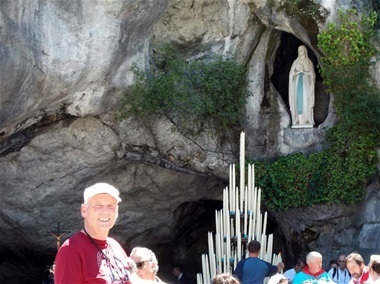 Founded by Monseigneur Rodhain in 1955, just fifteen minutes’ walk from the Grotto, beneath the Béout, it was established to cater for the poor who wished to visit Lourdes and could not afford four-star luxury. On fine days, Mass can be celebrated amongst the lush fauna on the mountain slopes. Our group was small enough to fit into a stone cottage and the mass offering was all the more intimate in the presence of the Lord, for that. After dinner, the group took its place in the candlelight procession to the rosary basilica, the association banner proudly borne aloft throughout by Michael and Agnes, with assistance from George and Teddy. It was fitting that they were given maximum exposure for the association, when facing the multitudes across rosary square, as the ceremony reached its conclusion. The weather broke, in that temperatures fell back to the mid-twenties and the sky was cloudy most of the day. After breakfast, the Bishop ‘fitted’ us up for our t-shirts, a process made all the more comical by his impersonation of John Inman. Then, we joined the group for Mass in the chapel of Saint Maximilian Kolbe, in the grounds of the sanctuary. This man was a polish friar, who was put to death by lethal injection, after forced starvation in Auschwitz, in 1941, having heroically taken the place of a fellow prisoner. In the afternoon, the two of us visited the Soubirous’s grave in the Cimetiére de l’Egalité before ascending to the giant Château Fort, built on a natural elevation overlooking the town. Used as a fort and a prison at times over the centuries, it is now a museum, which offers insights of Lourdes in the past, as well as breath-taking views of the modern-day town. After dinner, Father Terry guided us along the path of the upper stations of the Cross or Chemin de Croix. It was difficult enough just walking up the now concreted way, but for decades the Bishop and others pushed wheelchair-bound members over unpaved surfaces to pray before the life-size bronze images of Christ, his persecutors and followers. As we crested the brow of the hill, our presence pierced a cloud hovering over us and with Father Terry’s thoughtful commentary, an air of sadness and solemnity gently enveloped us. Happy Anniversary in Lourdes! We couldn’t think of anywhere more appropriate to spend it, apart from in the presence of our family; but in one sense we had become part of another family. The day was hugely significant for other memorable events. Father Terry celebrated Mass with us in Bartres, a small mountain village, where St Bernadette lived with her ‘Nanny’ – Marie Lagúes – on several occasions. In the centuries-old church, the names of the recently deceased members of CFI were read out and candles were lit in their memory. As Jo said afterwards, it was very emotional; and a very private sense of sadness pervaded the quiet of the tiny hamlet. At dinner, the group presented us with a luscious strawberry cheesecake, and everyone present, including the Italian ‘jackeens’, joined in celebration of our anniversary. On mind and tongue will memories linger. That evening, herself carried the Legion of Mary Vexillum in the nine o’clock, candlelight procession, flanked by her proud husband and Father Paul from Malta, while encouraged along the way by Marcello. She held the lighted standard aloft, on the steps of the rosary basilica, while the decades of the rosary were recited below us. The Laudate Marian and the Lourdes Hymn were sung and at the end, everyone in Rosary square offered each other the sign of peace. After the procession, we joined Father Terry and members of CFI in their own solemn procession. Through the enveloping darkness, we crossed the Gave once more, bearing two large candles, representing the dead and the living members of the association, families and friends. We stopped at the site where St Bernadette had viewed her Lady for the last time and lit the Candle of Life. We called out the names of those we wished to pray for. We processed again, and stopped on the perimeter of the prairie, just before the lower bridge, where we lit the Candle for the Dead. We called out the names of those we wished to be remembered. Then we carried the candles across the bridge, and finally placed them in the bruliére. After a final prayer and some moments of quiet contemplation, a most heartfelt sign of peace was offered by one and all to everyone present; and tears were shed there in the shadows of Massabielle, where gentle waters sprung from deep within. We packed, and had breakfast with the group one last time. The weather was too wet to walk in, so we had mass on the first floor of the hotel. Ben handed out the hymn sheets, George and Teddy served, Liam was the Eucharist Minister and Joe led us in song one last time. At the end, Father Terry put the Cystic Fibrosis stole away in its box, until next year. We said our sad goodbyes and boarded the bus to the airport. There, we met Father Terry, Michael, Noha, George, Joe and Teddy, who were also leaving Lourdes, to return to London. One last high-five from Teddy through a glass partition, and we boarded the plane to fly home to Ireland. In modern Lourdes, during a magnificent Continental Summer, surrounded by hotels, bars and garish souvenired supermarkets, it is easy to lose sight of the reason why Our Lady appeared in a ‘dump’ to a naïve, suffering, simple, poor but pious French teenager. But then, while sipping an expensive coffee in a street café, you see a train of stretcher and wheel-chair-bound pilgrims being pulled and pushed up a sloping street by hundreds of hospitaliers. This particular procession either returning from or going to the grotto seems to last forever; or at least until your coffee grows cold. Then afterwards in the company of the members of the CFA, you are struck by their stoicism, their strength, group-support and bravery in the face of harrowing, individual and combined suffering and loss. Lourdes, wonderful Lourdes, is a place where God tells us to come not just alone but with others; to pray for reconciliation and to immerse ourselves in our faith, with others. God loves us as we are and healing comes in many forms. It is through our shared experiences with the CFA members that we felt that most powerfully as a couple in the holy sanctuary.